Japanese Candy: Choose Hi-Chu ( ハイチュウ) for Flavor Fun! Choose Hi-Chu ( ハイチュウ) for Flavor Fun! A small sample of the Hi-Chu variety you will find at napaJapan! Hi-Chu (aka Hi-Chew) has one of those names that makes you wonder. 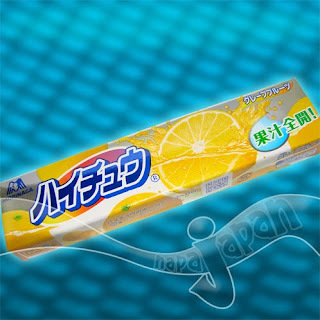 Was the maker, Morinaga, aiming to create an image of a candy that takes a lot of chewing? If so, would that be a desirable thought? I believe that the 'Hi' probably stands for the high concentration of flavor that these chewy candies deliver. Heavy chewing is not required. These soft candies are actually quite gentle on your teeth and can be enjoyed just melting away as you take in the full taste profile. Hi-Chu first appeared in Japanese stores in 1975 in very basic flavors such as strawberry and grape. Since then there have been hundreds of limited and regional edition flavors released. Currently, at napaJapan, we carry 18 unique flavors. Some of the more popular ones are Hokkaido Yubari Melon, Cola, and Peach. In 2010 Morinaga has expanded their Hi-Chu line to include Nobi Nobi (Stretch Sticks) and Hi-Chu Jr. (smaller packs of fruity flavors). Expect these to all be listed soon at our site. In 2009 there were two flavors that even had yummy bits of caramelized sugar embedded throughout each candy piece. We still have fresh stock of these unique flavors here: Cotton Candy and Candied Apple. A standard pack of Hi-Chu is 55 grams and contains 12 rectangular pieces. The smaller packs are 33 grams and contain 7 pieces. The colorful wrappers are very attractive and are fun to collect. Each piece is individually wrapped in foil paper so that they don't stick together. The candy itself is usually white on the exterior with a colored center. The texture is the same throughout and can best be described as a very soft caramel combined with a piece of bubble gum. Hi-Chu are much creamier than American Starburst and the pieces are about triple the size. Flavors are usually very accurate and intense. People of all ages in Japan enjoy Hi-Chu to give their mouths a refreshing and sweet lift. On your next candy order I recommend that you try Hi-Chu and see for yourself why it is so popular in the land of the rising sun. Until next time, Happy J-Snacking! You must have read my mind! I was just looking at your website last night at the daifuku hichew. Have you tried that one? it looks pretty interesting.